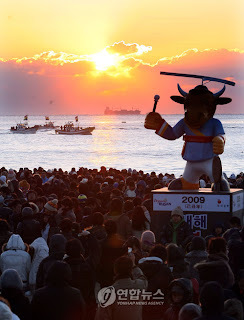 These are images from Korea, celebrating New Year 2009. 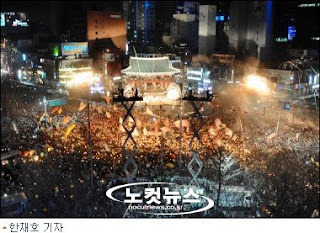 About 70,000 showed up at Bo Shin Gak, Seoul, and some of them were protesting against the present Korean government, Lee Myung Park's government. People who did protest carried yellow balloons that said "Adieu 2008, Out 2MB(which is Lee Myung Park)". To prevent this protest, 12,000 police officers were standing there, taking away their balloons and other protesting tools. I hope this year really goes well, unlike 2008.